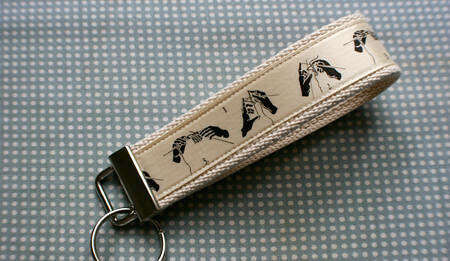 exclusively to the blog i'm selling this 'knitting instructions' keyfob. i know a few of you are die-hard knitters so i thought i'd give you first dibs at these. comment if you want one, send an email to tinkerellen@yahoo.com or just track me down on facebook. specs as follows: measure approximately 5" from fold to hardware end, so you can easily grab your keys from your purse or slip them around your wrist. 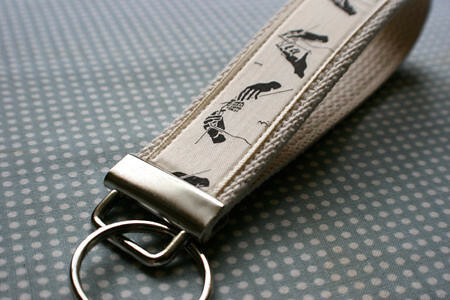 cream satin ribbon, stitched securely to 1.5" natural cotton webbing and finished with silver hardware. $6.50 each which includes shipping and i WILL ship international (even canada, eh). oh, and did i mention i only have three! have a great chilly october day!